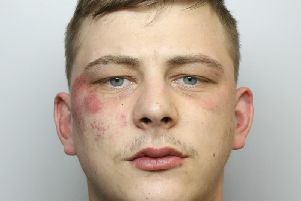 Men carrying weapons threatened a family in their own Wakefield home before escaping with cash. Police have issued an e-fit image of one of the man responsible for the late-night robbery which happened at a house in Brooklands Crescent, Havercroft. The men, who were believed to be carrying a knife and a hammer, entered the house at about 11.45pm on Tuesday (June 9) and made threats to the occupants before making off with a purse containing a small amount of cash and bank cards. Police say they believe the terrifying raid was a “targeted attack” and are continuing to follow up on a number of lines of enquiry. Detective Inspector Andrew Welbourn, of Wakefield District CID, said: “Although no one was hurt, this was a terrifying incident for the family involved. The first man (pictured) is described as white, in his mid-twenties, about 5ft 10ins tall and of stocky build. He had short, shaved blonde or ginger hair and a diamond chain tattoo just below his left ear and was wearing tracksuit bottoms. The second male was wearing a white rubber mask with black eyes. He was believed to be wearing a hooded top, which was possibly black in colour and was about 5ft 2ins tall. Anyone with information is asked to contact Detective Constable 6318 Atkinson at Wakefield District CID on 101.